Don’t you just hate when you have a recipe that calls for measuring something sticky like peanut butter, honey or shortening? It’s not really the measuring, but the clean up that’s the issue! So what do I do when all I have it a liquid glass measuring cup? Spray the measuring cup with no stick spray before you measure your sticky ingredient!- remove with rubber spatula, and clean up will be a breeze!! 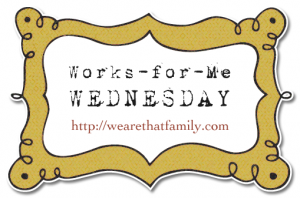 Have fun reading all the other tips over at We Are THAT Family and Works for Me Wednesday. 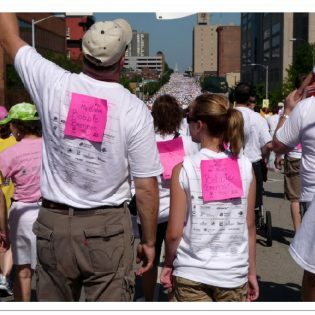 St. Louis Komen Race for the Cure- signed up! Yes, yes, and yes. I love easy clean up!!! great, great tip! My least favorite thing to measure ever is honey. I'm definitely going to try it with honey now. Ooohh…so simple! Why didn't I think of that!? Great idea, I need to remember to do this!! What a great tip! Thank you! doh! How have I never thought of this before? Thanks! Well ain't that a dandy. Never though of that before. I'll have to try it out 😀 Thanks for the tip! Great tip. Works great for honey too! 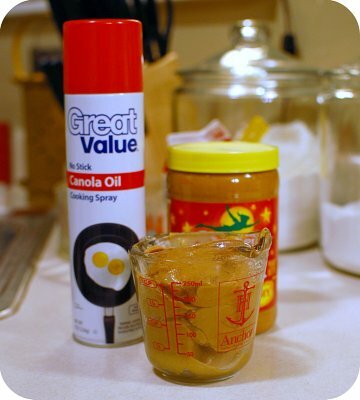 I use this method for corn syrup, honey or molasses and it works great! …but for peanut butter or shortening..I use very cold water. If you need 1 cup peanut butter, use a 2 cup liquid measuring cup add 1 cup of very cold water…put in PB or shortening until the water shows 2 cups, holding the BP or shortening under the water..pour the water out and you have 1 cup of BP or shortening..hardly any clean-up! I use it for honey and it makes cleaning a dream. 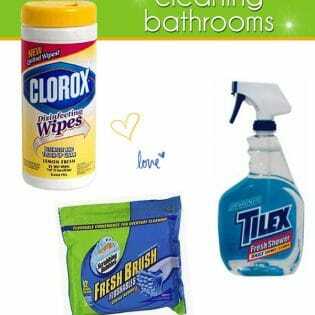 IT is a really good tip for those of us who want to minimize clean-up. Anonymous – I've used that method too! works great, but some recipes you have to be careful with the water getting in the recipe……but you're right – that's another GREAT way to measure those things!! I just stumbled across your blog, it's darling! Love everything about it.